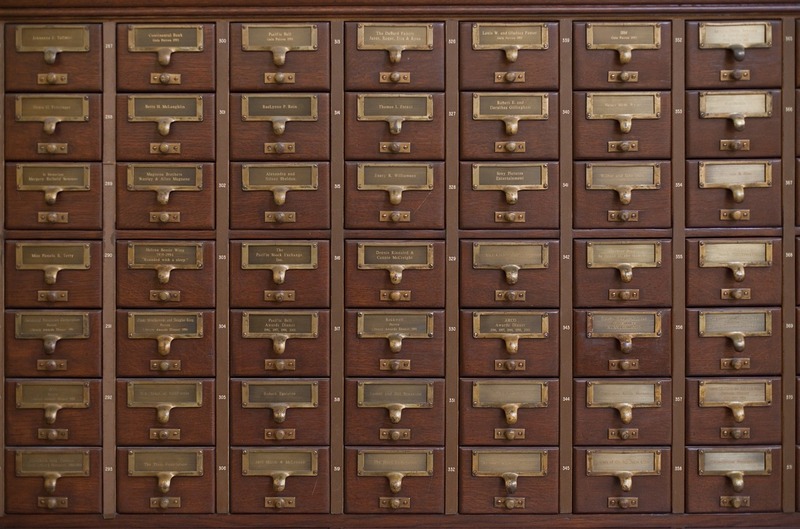 Bibliographic Tools are the card catalog of the digital age. Whether you write conference paper or prepare your manuscript for a journal submission, a well presented review of the literature together with correct citations and references significantly increase your chances to be accepted. Furthermore, it will make it easier for others to understand what exactly your research question contributes to the field, and allow them to follow up on the arguments you are presenting. This blog post comprises tips and tricks for your next literature review: (1) Finding relevant sources, (2) Citation Standards and Tools (3) Organizing your literature. As Johannes Cronje states in his free online doctoral program: ‘A good literature survey can be published as a research article on its own. Thus it follows the same basic structure as any other piece of research’. Relate the findings of the literature review to the article’s topic or question. Use comprehensive sources and report the search procedures. Critically discuss aspects of the research design and analysis. Consider contrary findings and alternative interpretations. How do you identify the relevant, current contributions in a field? How can you narrow down your choices based on the audience and community you are writing for? 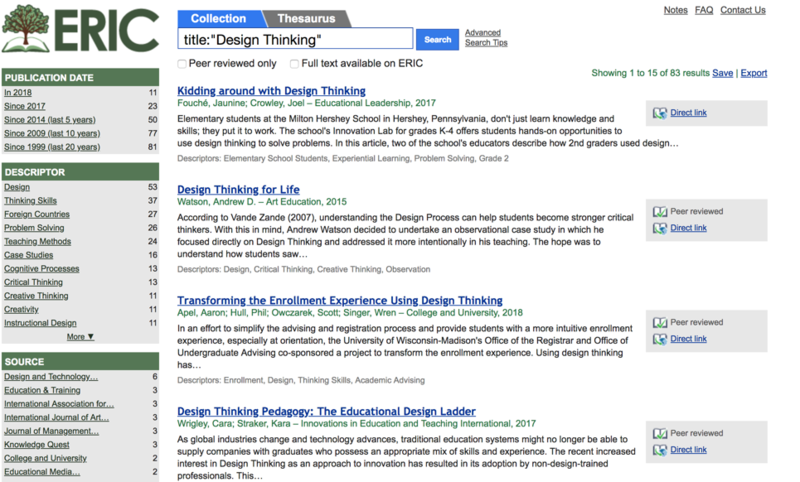 For Edtech researchers, we review the three repositories LearnTechLib, ERIC and Google Scholar. The AACE digital library LearnTechLib comprises over 135,000 full text articles and abstracts, from 30+ years of research. This repository includes proceeding from hundreds of AACE and SITE conferences, articles from AACE journals as well as other content partners, covering a total of 2291 journals. In addition, it indexes e-Books, Reports, Dissertations, Videos, Keynote Talks, Presentation slides and Webinars. The Power Search option allows readers to focus their search. For the topic ‘Design Thinking’, I can reduce my results from over 1500 to mere 22 by using full Boolean query syntax – in my example, I specified that I only want to focus on articles with the full term in the title (title:”Design Thinking”). Note that I can create a ‘Search Alert’ that will notify me of new entries. The first step in working with the results is to save the search results to ‘My Collections’. This way, I can revisit the articles any time, and share my bibliography list with others – you can access the example here. What makes LearnTechLib a powerful research tool with huge time saving potential is the ability to export the references in a collection in different bibliographic formats such as EndNote or BibTex. It also integrates directly with RefWorks. Another advantage is the large number of full text articles. ERIC is an online library of education research and information, sponsored by the Institute of Education Sciences (IES) of the U.S. Department of Education. The database ERIC is a free resource. How does my search for ‘Design Thinking’ articles work in this environment? In ERIC, I can likewise use Boolean operators to narrow down my results. Using the same syntax query, I receive a total of 83 hits in the database, 28 available as full text. The options for saving and exporting the research are fairly limited: Readers can save the link to the search page, and send themselves an email with a list of the first 50 results of their query. Only one bibliographic file format is supported (the PubMed format .nbib). Google Scholar is likely the most frequently accessed source for scientific literature. However, this does not make it the most useful tool for each and every purpose. Scholar does not support Boolean operators such as ‘author’ or ‘title’. 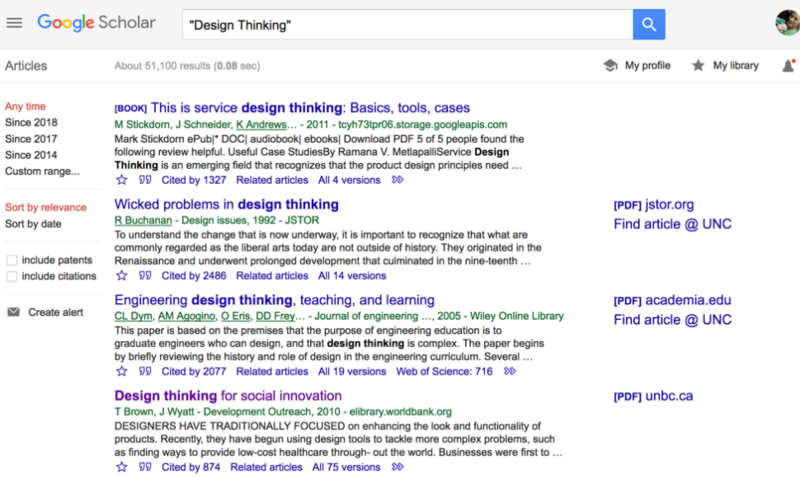 Hence, my query for “Design Thinking” produces over 51,000 results – a seemingly unmanageable amount. The vast amount of results seems to be both the strength and weakness of Google Scholar. It is usually advisable to alternate between the general topic and more specific search terms. Filtering results by date (for example: Since 2017) allows researchers to get a sense of the new developments and trends in a field. The citation count is helpful for identifying the core, standard publication on a topic to include seminal definitions and concepts. If you are logged in through a campus network, Google will automatically connect to your library accounts (see ‘Find articles @ UNC’). Using bibliographic software can save you hours of unnecessary, tedious work. Shared standards and tools such as BibTex allow you to export and import references, add them to your documents, and easily switch from one citation standard to another – this is particularly useful when you work in an interdisciplinary field such as EdTech that is dominated by APA, but also includes Harvard or LNI citation style. Citation tools make it easy to cite articles in a consistent manner, by separating bibliographic information from the presentation of this information. Standardized bibliography tools and file formats such BibTex, EndNote or RefWorks enable authors to search bibliographic databases, organize references and create and format bibliographies. These tools also typically integrate into the Microsoft Word interface, so that you can cite and create your reference list seamlessly. BibTex works specifically well with LaTex. It’s worthwhile to find out what tools your institution supports and what your colleagues are using. If you seek a ‘forever home’ for your research reviews, consider a free tool such as Mendely, Citavi, CiteULike or Zotero. Whichever tool you choose, you will have to spend the effort of integrating and importing your existing references. Freesite is a tool that will help you consolidate different sources into a citation management system. The open-source application parses document citations into structured data. We describe for the example of the open source software Zotero how to import bibliographical data from different sources, and how to organize and cite your research in office products. Zotero is a free application that collects, manages, and cites research sources. It offers a browser add-on that supports the extraction of bibliographical information from a web catalog. Users can add several articles to a collection with one click. Especially useful when you are creating a collection through imports from different sources is the option to consolidate duplicate entries. You can also add notes to each article. Once you have created and curated your literature collection, you can use Zotero to organize your ideas, cite research, and create bibliographies automatically in different citation formats. The current version Zotero 5.0 includes a word processor plugin that adds a Zotero tab to Microsoft Word. Additionally, Zotero can be used with any office document or Google Docs as well as with plain-text documents or emails by copying a bibliography to the clipboard. 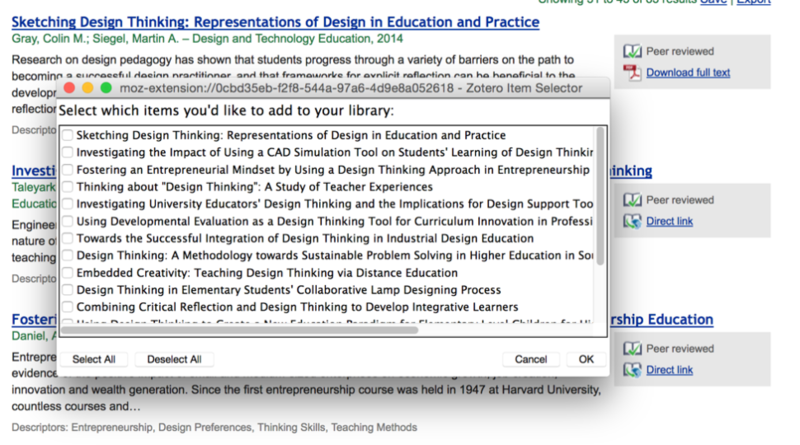 If you want to simply add one article to an existing reference list, you can simply use drag and drop. Furthermore, researchers can export their collection as a spreadsheet, which is extremely helpful for organizing articles and taking notes. 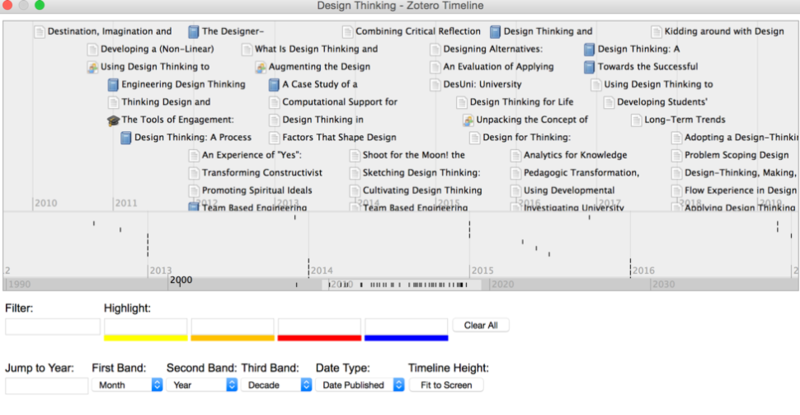 Another potentially useful feature is the option to visualize publications on a timeline. While there are no shortcuts to a well written literature review section, using bibliographic formats and tools will make it considerably easier to organize your research, produce consistent bibliographies that are aligned with citation standards, and collaborate with colleagues. Your manuscript is now in great shape, and you are ready to submit to a journal? Read the tripartite series of AACE Review posts on selecting the right journal and sharing your work.